Sopas is a traditional Azorean soup ladled onto delicious and wonderfully scented mint-covered bread. It is made most typically during religious holidays and festivals such as the celebration of the Holy Ghost. Each island has their own particular way of making this dish. Although being Azorean ourselves here at the website we might be a bit biased, but truthfully this is such a great dish that must be tried and can be made without too much fuss. Go ahead and try it out and tell us what you think! 1) Combine all of the ingredients except the water, mint, cabbage, and bread in a large stock pot. 2) Now cover the ingredients with the 8 cups water. Let it boil for about an hour until the meat is tender. 3) Now add the cabbage to the pot. 4) Let the pot simmer on medium to low heat for about half an hour until the cabbage has been cooked. 5) Once the ingredients in the stock pot are done cooking, cover the bottom of large, shallow serving dish with the bread slices. 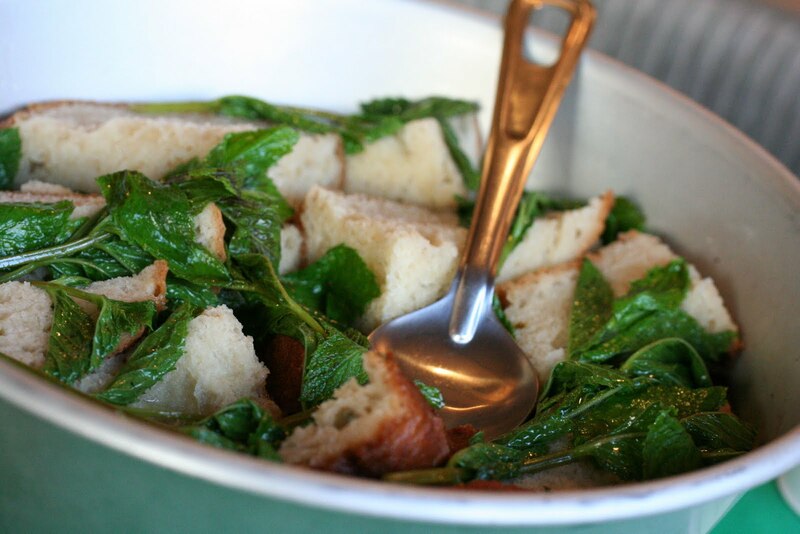 6) Lay the mint leaves on top of the bread slices. 7) Ladle the content from the stock pot equally on top of the bread and serve while hot. Thank you for posting this wonderful recipe. My grandfather was from the Azores and since he has passed away (at 104 years of age I might add) we no longer have these wonderful delicacies at our family gatherings. Thanks so much. This is a delicious soup! Have been so looking for someone with this recipe. Thank you I surely am going to try this! I grew up eating these soupas with the mint. This is the best! Thanks! Thank you so much for your kind words! We are so glad you enjoyed this recipe. when i was a child, every year we would go to the Portuguese Picnic in Lincoln, California. There was a parade, a queen and a carnival and always at the back of the picnic grounds, a group of men cooking “sopa” . In those days, (I think) we could get a plate (bowl) of the sopa for 50 cents. The aroma was magical. Years later, I came home to visit my mother and walked into the house and the memories flooded me. I asked my Mom, “What are you cooking?” She answered Sopa. Well, I got that recipe and have been making it for years. We use a good quality sourdough for the bread and all my family just can’t get enough when we do make it. Thanks so much.